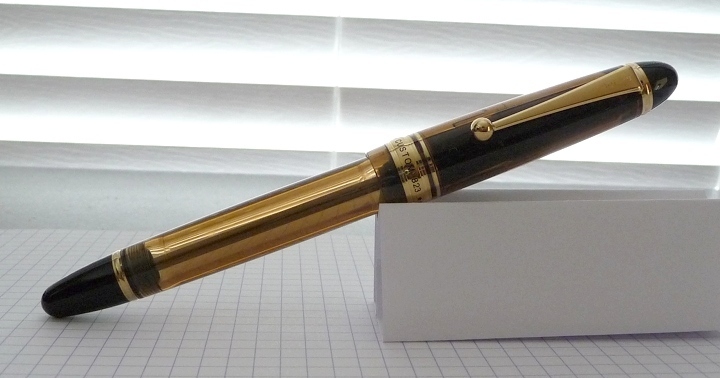 The Dizzy Pen | Fountain Pens, Inks, and More! It has been a very very long time since I have visited my blog let alone updated it. I fully intend on returning to blogging, but I’ve been going through some major life changes since I was last here. I’ve received several kind messages and well wishes from you all, and I just wanted to say thank you. I mean that from the bottom of my heart. As you all know, my grandfather has been gravely ill. I am sad to say that he passed away today at the age of 91. I’ll be traveling and dealing with family/arrangements for a while. I won’t be able to blog. I think I have a couple posts auto-scheduled for the interim, but I won’t be around to answer questions, etc. I will be back on October 3 with a HUGE announcement that you won’t want to miss, so be sure to check back. My attraction to brown inks is a fairly recent one. I used to detest them. Why? I’m not really sure. I suppose I just built up a sort of brown ink block. Boy have things changed now. 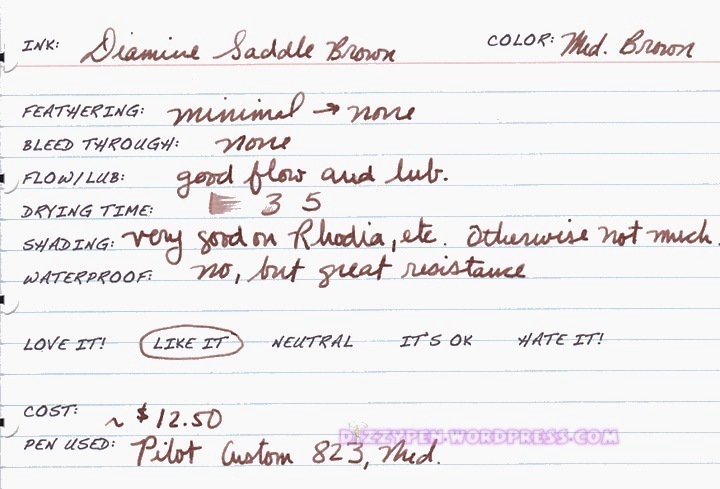 I recently reviewed Diamine Saddle Brown, it is one of my favorite brown inks. 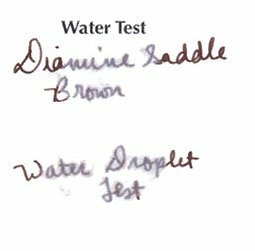 Well, Diamine Chocolate Brown is my second favorite Diamine brown ink and probably one of my all time favorite browns, up there with Caran d’Ache Grand Canyon Brown and Noodler’s #41 Brown (old formula). Now, I generally don’t care for browns that lean toward another color. Chocolate Brown, like milk chocolate leans a little toward red. 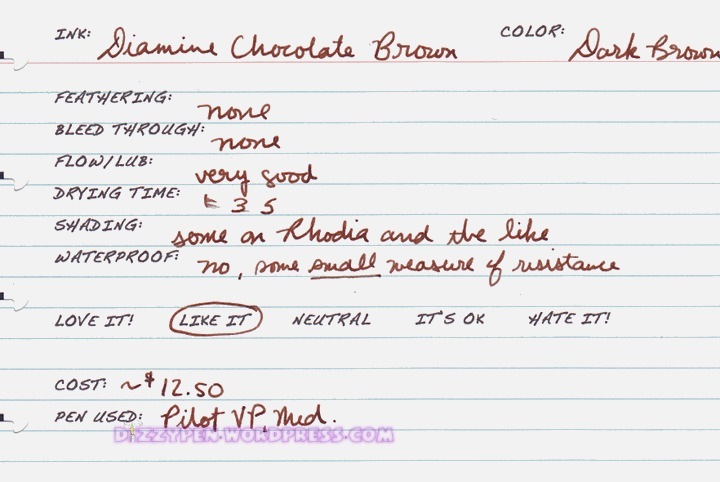 It is subtle enough to not bother me, but not so subtle that you can’t notice that there is just a little something different about Diamine Chocolate Brown. This is definitely a good dark brown ink. Very good flow and lubrication. Some shading on coated papers. 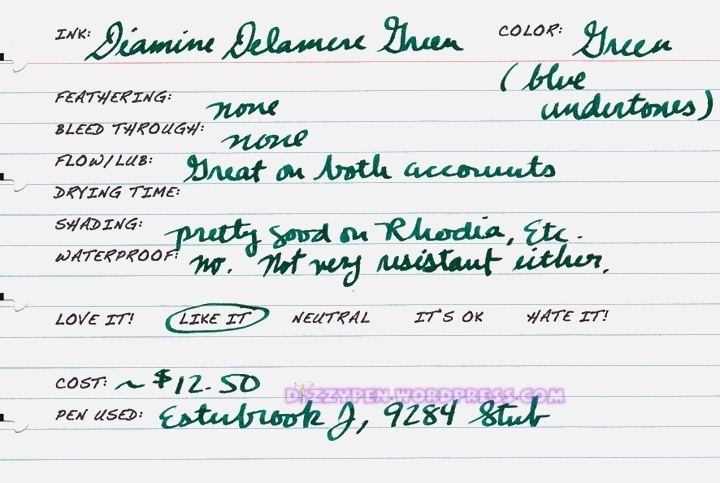 This ink was sent to me for review by the good folks at Diamine Ink Co. I am not otherwise affiliated with them. 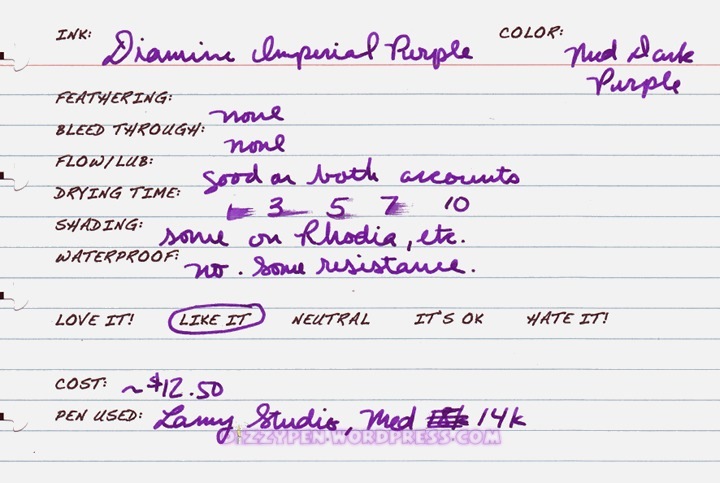 Here is another great purple: Diamine Imperial Purple. This is another ink that is “just purple” to my eye. It is very similar to its label-mate: Majestic Purple, except that Imperial Purple has just a touch more red to it, and I find it to be a more vibrant color than Majestic Purple. As compared to the newest love of my life, PR DC Super Violet, Imperial Purple is similar, but a bit more red and somehow a bit less exciting. Still, when it comes to purples, this is also a very good choice. Average drying time. This Lamy Studio is a very wet writer. Shading is ok on coated papers and pretty much nil on absorbent papers. Not waterproof. Some measure of resistance if you are quick to clean up any spill. This is going to be a handwritten review of the 90g Clairefontaine Graf It Pad. This is one of my favorite papers for writing down quick notes, lists, etc. As you can tell by the cover and the name, this pad is intended for sketching, but I find it works very well as paper for fountain pens. I am not an artist, so you won’t see any sketches here, but I hope you find this review useful nonetheless. Pad is staple bound at the top. Cover is made of card stock. Front is flexible and the back is stiffened by a piece of backer board. Sheets are perforated for ease of tearing. Pad opens flat, but it can be difficult to write on the back of the sheet. 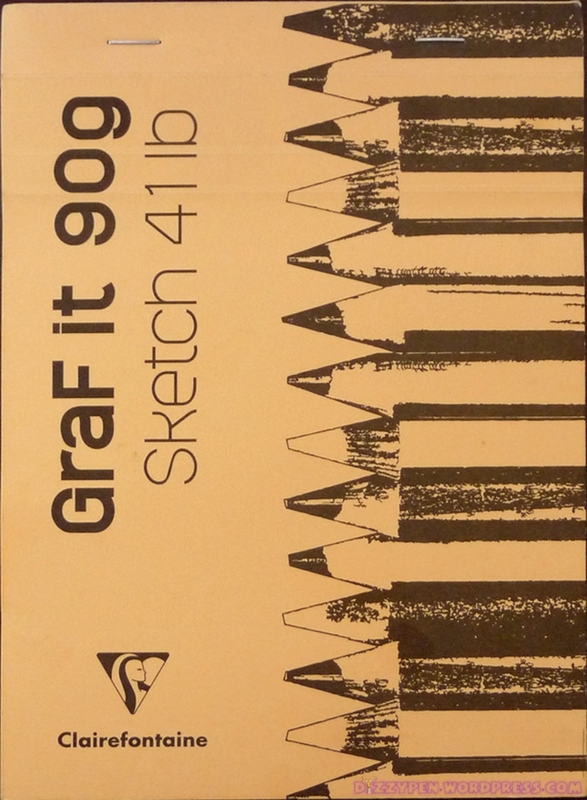 Graf It paper is 90g and slightly off white. Unlike other CF papers this has a light texture to it. Takes fountain pen ink well with no feathering or bleeding. I apologize for the ink color in these scans. I could not get the colors to show up any more accurately than this. 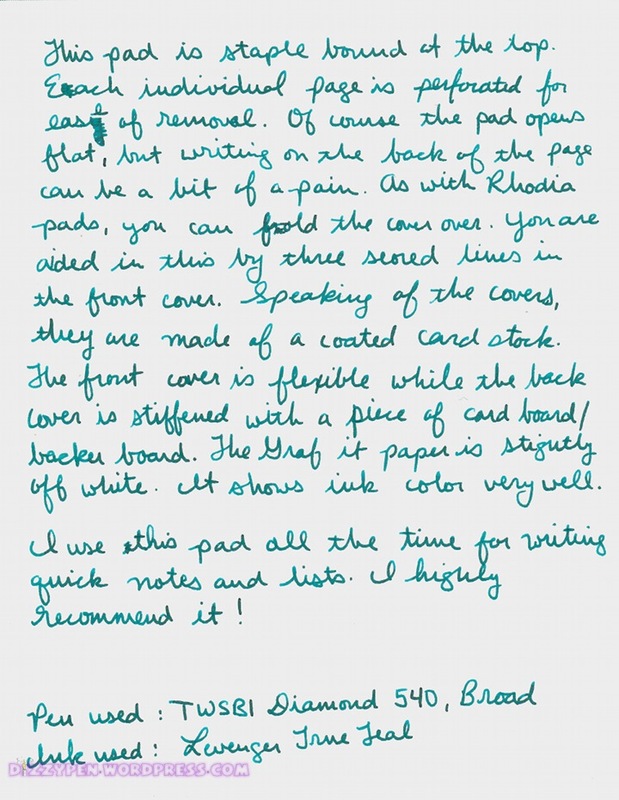 The Levenger True Teal was a vibrancy to it that the scan has completely flattened. I won this notepad in a Goulet Pens giveaway many months ago. I am not affiliated with them or Clairefontaine. 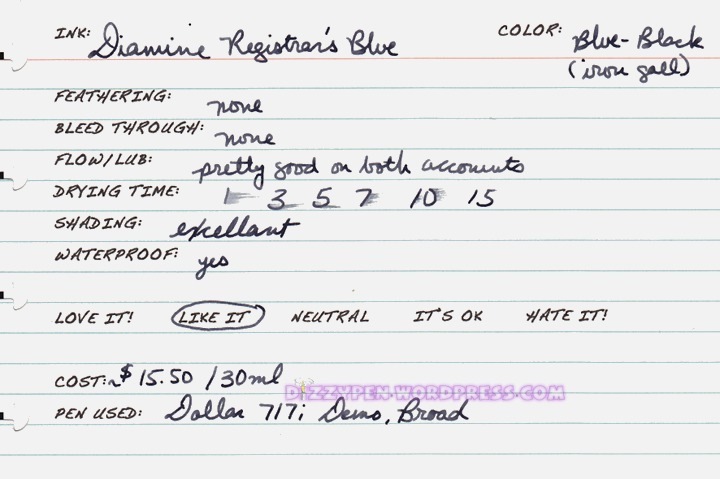 Up today is Diamine Registrar’s Blue. This is one of very few Iron Gall inks on the market. I have previously reviewed two other iron gall inks: R&K Salix and R&K Scaboisa. When I first attempted to use this ink I experienced a near immediate clog. When I filled my pen, I had dipped it all the way to the bottom of the bottle. Iron gall inks tend to have a lot of sediment in comparison to conventional modern fountain pen inks, so I likely sucked some of that sediment into the pen. I flushed the pen without much difficulty, and filled it again with this time not dipping the pen too deep into the bottle. The second time worked out just fine, and I had no clogs. This potential for sediment and the acidity of the ink put iron gall inks in the high maintenance category. 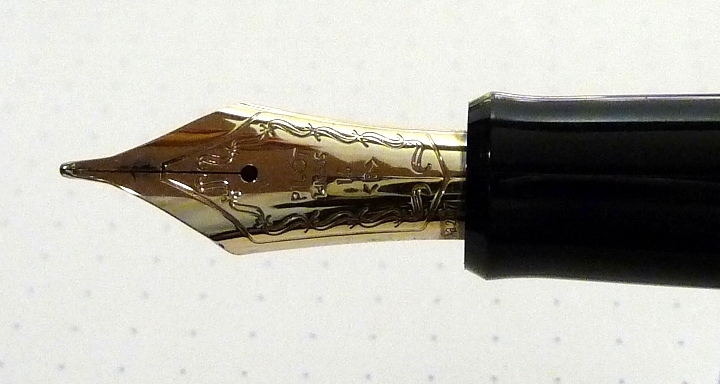 In my opinion, this ink is worth the extra effort. No feathering or bleeding. This ink performs admirably on poorer quality papers. Flow and lubrication are pretty good, but iron gall inks tend to run a bit dry. This ink is no exception. Drying time is a bit long with a wet writing pen. PS: I just wanted to thank everyone for their thoughts and prays. I have made it back from my trip to see my grandpa. He is stable, but not doing well at all. I’m just glad I got a chance to spend some time with him before it was too late. If you are a member of FPN you may know that my grandpa has been gravely ill. I had to fly home to be with him, so I won’t be able to post any new reviews for the next week. I appreciate all the prayers and well wishes I’ve received thus far, and I ask that you please keep my family and I in prayer during this difficult time. Hello all! I just got a new monitor. I’ve been messing around with the color calibration. I think I’ve got it right, but I’m not all the way sure. If my scans start looking really off please let me know. This has been really frustrating! Up today is Diamine Saddle Brown. 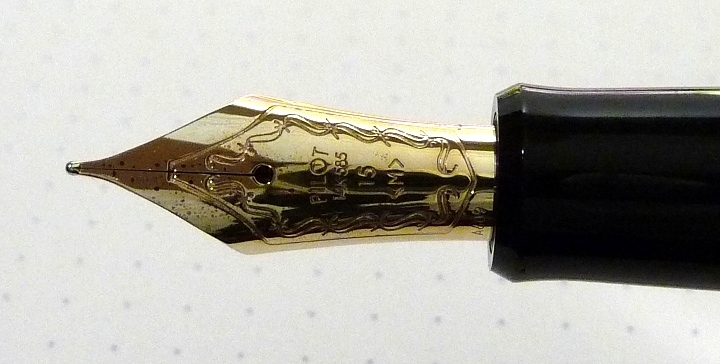 This is one of my favorite brown inks. To me, it is a true medium brown with very slight reddish undertones. It doesn’t lean heavily one direction or the other. It’s also quite well-behaved with a little water resistance as well. 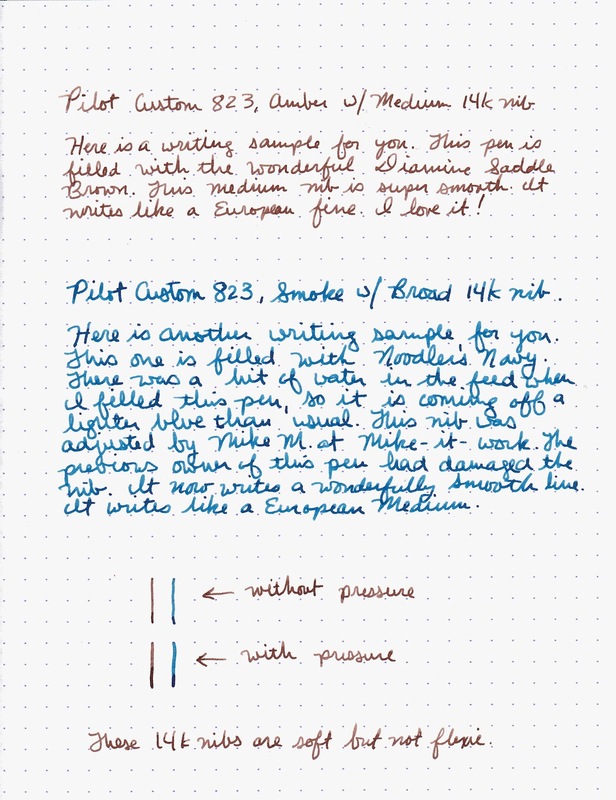 This is the ink I chose for my first fill of my newest pen: the Pilot Custom 823 in Amber with a Medium nib. These two inks love each other! Minimal to no feathering depending on the paper. Average drying time at 5ish seconds. Very good shading on coated papers like Rhodia. Otherwise, there isn’t a whole lot of shading. Not waterproof, but it is resistant. See image below. 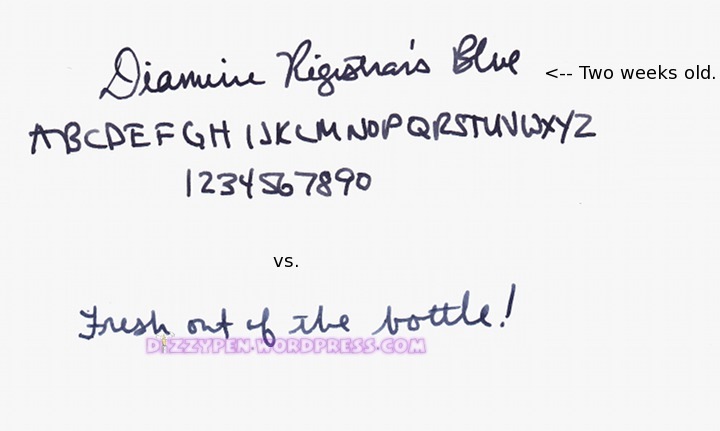 This ink was sent to me for review by the good folks at Diamine. I am not otherwise affiliated with them.